Wood or fruit? The role of oak in wine If wine is supposed to be made from fruit, why does it so often smell and taste like wood? For today's discussion, let's take a look at the use and abuse of oak in wine. For many centuries, wine makers have stored wine in sturdy, watertight wooden barrels - most often made of oak - and it didn't take long to discover that this process not only kept the wine safe from deterioration but actually added flavors that wine lovers enjoyed. It's hard to generalize about the exact effects of oak on wine because so many variables apply. French, American and Yugoslavian oak are all widely used, each conferring somewhat different characteristics; moreover, some high-end wines even distinguish French oak by its forest of origin, such as Limousin or Nevers. Oaking affects reds and whites somewhat differently; new oak has different characteristics (usually stronger and more harsh) than used oak barrels; and the amount of time the wine spends in oak is also significant, as is the wine maker's decision whether to ferment the wine in oak containers, whether to store it after fermentation in large or small casks, and whether to use casks that have been "toasted" (lightly charred) or not. Despite all these issues, oak almost invariably leaves identifiable traces in the wine. A noticeable vanillin aroma is commonplace, especially with American oak in white wines like Chardonnay and fruity reds like Merlot, where the vanillins often convey a sense of sweetness that seems to appeal to the marketplace. Over-oaked wines may literally smell like wood, very much like the smell in a house with freshly sanded floors. In reds, especially California and Australian Cabernets, new American oak often smells like the herb dill. Particularly in Mediterranean reds, from Rioja to France's Languedoc, oak flavors show up as coconut or aromatic spices like cinnamon, cloves and nutmeg. French oak, used in restraint, is often more subtle; I generally record it in my notes as a light, delicate spiciness or occasionally something organic like damp wood on a forest floor. All this only touches the surface, but in general, the scents of oak are non-fruit aromatics, and that's why wine makers use them, in the best case to enhance, and in the worst case to substitute for, the natural fruit aromas of good wine grapes. What's your take on oaky wines? Share your opinions by E-mail to wine@wine-lovers-page.com. I regret that the growing circulation of the "Wine Advisor" makes it difficult for me to reply individually to every note, but I'll answer as many as I can; and please be assured that all your input helps me do a better job of writing about wine. Please feel free to get in touch if you'd like to comment on our topics and tasting notes, suggest a topic for a future bulletin, or just talk about wine. If you're enjoying The 30 Second Wine Advisor, we hope you'll tell your wine-loving friends to register for their own free weekly copy at http://www.wine-lovers-page.com/wineadvisor. FOOD MATCH: Very fine with a simple Italian dish of chicken breast braised with wild mushrooms. Wine Lovers' Voting Booth Happy New Year to all our wine-loving friends around the world! It's 2000 now, and just as every New Year, it's time to think about making a few resolutions. As wine lovers, some of those pledges to change our ways in the new year might relate to our favorite beverage. So, just for fun and if it's not too personal, I hope you'll drop by our Wine Lovers' Voting Booth and let us know: What's your wine-related New Year's resolution? 30 Second Wine Link With the possible exception of the great dessert wine Tokaji and perhaps Egri Bikaver, the inexpensive red wine known as "Bull's Blood," Hungarian wines remain largely a mystery to most of us. But with the fall of the Iron Curtain, Hungary's fine wines are starting to move into the world market. One good place to get an advance peek is Borbarát, Friends of Wine, an excellent Hungarian wine magazine that publishes this good, thorough and easily navigable site in English. 30 Second Advertising Partner California Wine Club, www.cawineclub.com, is the perfect, affordable way to get two different bottles of excellent wine every month, along with its fun and fact-filled newsletter Uncorked. Commercially unavailable, these wines are like secret treasures we hand-select from California's small, award-winning wineries. Join for as many months as you like, or use The California Wine Club as a special, unique gift for friends, family, customers and colleagues. You can reach the Club at the link above or, in the U.S., by calling 1-800-777-4443. 30 Second Administrivia This free weekly E-mail publication is distributed to subscribers every Monday. Previous editions are archived on The Wine Lovers' Page. 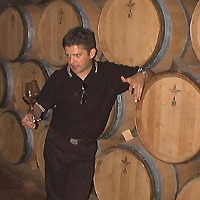 See www.wine-lovers-page.com/wineadvisor/thelist.shtml. You are on the subscription list because our records indicate that you registered during a visit to Robin Garr's Wine Lovers' Page. If for any reason you don't want to receive this publication, simply send E-mail to 'wine@wine-lovers-page.com' and we'll remove your name from the list. We do not use this list for any other purpose and will never give or sell your name or E-mail to anyone. If your E-mail program is having trouble handling the images in this edition, feel free to request that we switch you from the HTML to TEXT edition ... or vice versa. We welcome feedback, suggestions, and ideas for future columns. Send us E-mail at wine@wine-lovers-page.com. More time for wine? You don't need to wait for Mondays to read about wine! Drop in any time on Robin Garr's Wine Lovers' Page, where we add new tasting notes several times each week and frequently expand our selection of wine-appreciation articles, tips and tutorials. If you'd like to talk about wine online with fellow wine enthusiasts around the world, we'd be delighted to have you visit the interactive forums in our Wine Lovers' Discussion Group. If you're from another part of the world and don't feel entirely comfortable chatting in English, visit our International Forum and introduce yourself in the language of your choice.